Usually, when one thinks of a podium in the Bronx, it’s there to say hello to a new million dollar acquisition. This time, however, the media hordes were assembled to say goodbye to one of the team’s all-time greats. That’s why, as Andy Pettitte answered questions about his decision to retire, the proceedings took on somewhat of a surreal feeling. After all, if Pettitte was healthy enough to pitch, capable of performing at a high level (his ERA+ of 130 was the fourth highest in his career), and greatly needed by the Yankees, why exactly was he walking away? As expected, Pettitte’s reasons for retiring centered on his family. According to the lefty, his heart simply wasn’t into returning because the other aspects of his life were pulling on its strings. Considering that Pettitte’s heart has always been in the right place (although Yankees’ fans might not like where it is now), his reasoning was perfectly understandable. And yet, it is still hard to imagine a great player voluntary walking away from the game when he still has the ability to perform. 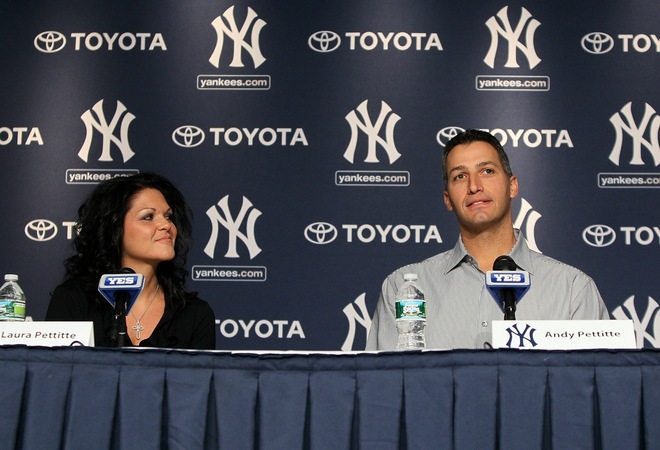 Andy Pettitte and wife Laura field questions at press conference announcing his retirement (Photo: Getty Images). At the beginning of the proceedings, Jason Zillo, the Yankees director of media relations, made an interesting comment about Pettitte’s press conference being a unique event in his 15-year tenure with the team (which is almost as long as Pettitte’s). In fact, the validity of the comment extends well beyond Zillo’s time in the Bronx. Despite having scores of superstar players who spent the bulk of their careers with the team, the Yankees have not hosted many press conferences to announce the retirement of a legendary figure. Since 1901, the Yankees have had 22 position players (minimum 1,000 games) and 10 pitchers (minimum 200 games started or 400 games) compile a WAR greater than 30 during their time in pinstripes. However, from that illustrious group, only three have had a formal press conference to say goodbye on their own terms: Joe DiMaggio, Mickey Mantle, and now Andy Pettitte. Like Pettitte, DiMaggio had been hinting at retirement for some time before eventually making his final decision. During the course of his injury plagued career, Joltin’ Joe would often hint at walking away, but he finally formalized his intentions during the spring of 1951. Despite the dramatic announcement, not too many people expected DiMaggio to actually retire, and the doubts lingered even after he had a subpar year by his standards (OPS+ of 115 in 482 plate appearances). 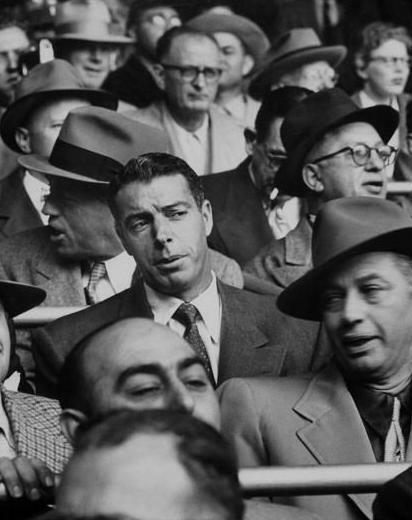 However, after winning the World Series against the cross-town Giants, DiMaggio again told reporters that he probably wouldn’t be back in 1952. Most people still shrugged off the statement, and even Yankees’ owner Dan Topping didn’t seem convinced, telling DiMaggio, “you might feel differently a month from now”. Almost 60 years later, Cashman would be telling Pettitte the same thing. When he finally retired, DiMaggio was still a good ballplayer, but the Yankees had a kid named Mickey Mantle on the rise, and the Yankee Clipper didn’t seem too interested in a position change. So, manager Casey Stengel probably wasn’t too disappointed by DiMaggio’s decision (at least not nearly as much Girardi is sure to be without his ace lefty). After carrying the torch from DiMaggio for 18 seasons, Mantle’s time to say goodbye came during spring training in 1969. Again like Pettitte, Mantle’s 1968 season was very strong (although his .237 batting average likely overshadowed the true value represented by his OPS+ of 142), but a combination of injuries and personal issues convinced him to walk away. With the help of manager Ralph Houk (whose sentiments were echoed by Tino Martinez’ text to Pettitte), Mantle finally came to a decision and made the announcement before what the AP described as “a packed news conference at the New York Yankees spring training hotel”. Since the Mick bid farewell, no Yankee has walked into the sunset amid such wide media coverage. On the pitching side of the ledger, Whitey Ford’s career ended just after the start of the 1967 season when a bone spur in his left elbow made pitching without surgery nearly impossible. Ford walked off the mound after only one inning of his start on May 21, and then four days later his retirement was announced in a statement released by the team. Ron Guidry, another one of the team’s best pitchers, had an even more unheralded end to his career. Instead of throwing his last pitch in the Bronx, Guidry final’s delivery came as a member of the triple-A Columbus Clippers. 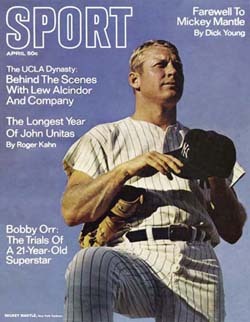 In stark contrast to Pettitte’s situation, George Steinbrenner had to insist that Guidry, whose previous season had been cut short by injury, be invited to camp over the objections of manager Dallas Green. An elbow injury delayed the ultimate roster decision, but after another stint on the DL and seven rehab starts in the minors, the Yankees still couldn’t find room for Louisiana Lightning in a frightful rotation that included Richard Dotson, Andy Hawkins and Dave LaPoint. The writing was on the wall, so Guidry had little choice but to retire. Mike Mussina is a recent example of a Yankees’ pitcher who went out on top, retiring after winning 20 games in 2008. However, befitting his personality, the Moose called it quits via a conference call. What’s more, soon after his departure, the Yankees were introducing C.C. Sabathia into the fold, so that offseason was more about looking ahead than reminiscing. Note: Minimum WAR of 30 in at least 1,000 games. No one was more legendary than Babe Ruth, but his career came to an end only after being utilized as a PR ploy by the Boston Braves for a couple of months in 1935. Claiming he had been double crossed by team president Judge Emil Fuchs, Ruth threatened to quit, so the Braves simply fired him. A poll taken by AP at the time found that no other major club had anything more than an “academic interest” in the Sultan of Swat, so Ruth’s career was suddenly over. Ruth’s departure from the game was ignominious, but Lou Gehrig’s was truly tragic. Before removing himself from the lineup on May 2, 1939, Gehrig had played in 2,130 consecutive games. After that day, he’d never take the field again. Only July 4, the Yankees held Lou Gehrig Day, which undoubtedly will go down as the most emotional farewell in baseball history. 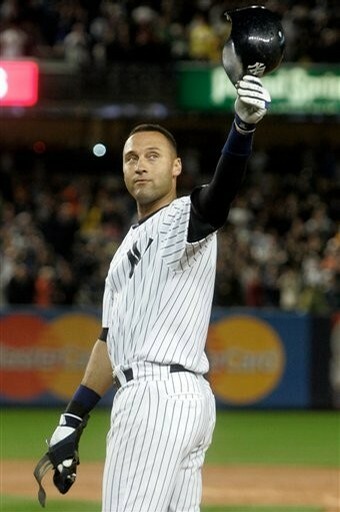 The day was not so much about saying goodbye to Gehrig’s baseball career, however, but rather the man himself. Just under two years later, Gehrig was dead, the victim of a cruel disease that now bears his name. Sadly, in 1979, tragedy would visit the Yankees again when all star catcher and team captain Thurman Munson perished in a plane crash. At least in Gehrig’s case, the fans and his teammates had a chance to say goodbye. How will Derek Jeter say goodbye? Between those two extremes, the Yankees have seen several legends walk away from their playing careers in very subtle fashion. Yogi Berra really never said goodbye because his career transitioned directly into the manager’s chair when he went from player to skipper in 1964. Fellow catcher Bill Dickey also had a brief stint as manager and a long tenure as a coach. Phil Rizzuto was famously bumped up to the broadcast booth in 1956 when the team no longer had room for him on the roster, while 1970s stalwarts Willie Randolph and Graig Nettles bounced around with other teams after their time in pinstripes had run its course. Then, there were Yankee lifers like Don Mattingly and Bernie Williams who never even bothered to officially retire. Apparently, it isn’t easy to say goodbye. As rare as press conferences like Pettitte’s have been in the past, Yankees’ fans better get used to them because there could be three more looming in the near future. Jorge Posada, Mariano Rivera, and Derek Jeter aren’t getting any younger, and eventually it will come time for them to say goodbye. Will they be the ones to walk away? Or, will the game pass them by? What happened to one of my favorite players? A lifetime Yankee, and one of the most under appreciated. White is one of the more underappreciated Yankees of all time. After he couldn’t come to terms with the team after the 1979 season, he went to Japan, where he played three seasons with the Yomiuri Giants. Then, in 1983, he returned to the Bronx as a coach.